The State of Israel and the Jewish people have a legitimate right to all of Jerusalem  including the parts of the city that lie east of the green line  according to a 90-year-old valid legal document. The San Remo Resolution is the subject of research of international law scholar and lawyer, Jacques Gauthier, Ph.D. The Toronto-based Gauthier, who is Christian, spent a quarter-century researching and writing a 1,300-page thesis to investigate legal ownership rights of the ancient-modern capital city. Bridge Houston brought Gauthier to Houston on Nov. 15, 2010 to discuss his work. The San Remo Resolution was signed April 25, 1920, following World War I and the Paris Peace Conference. Its signatories were the Supreme Council of the Allied Powers, which included the United States, Britain, Italy and France. A precursor to San Remo was an agreement between Jewish and Arab leaders to recognize Jewish claims over then-Palestine and Arab claims over an independent Arab state in the bulk of the Ottoman territory. 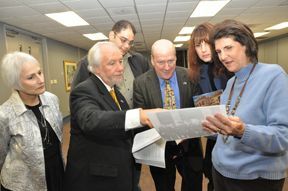 Through San Remo, a legal document, "The Jewish people have been given the right to establish a home, based on the recognition of their historical connection and the grounds for reconstituting this national home," Gauthier explained during his presentation at the Jewish Community Center. Gauthier called San Remo "the cornerstone of the rights of the Jewish people" vis-à-vis land ownership in Israel. He ranked San Remo higher in importance, from a legal standpoint, than the wider-known 1917 Balfour Declaration. According to Gauthier, the issue of sovereignty over Jerusalem remains one of the most "intractable, controversial and sensitive" problems of the Arab-Israeli conflict. Ownership of Jerusalem's Old City "is the ultimate bone of contention," he said. 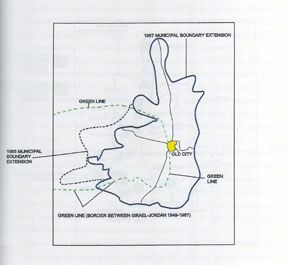 Jacques Gauthier' dissertation contains a map showing that if Jerusalem were to be divided along the "green line," the Old City would fall under Arab Palestinian control. Israel maintains that all of Jerusalem belongs to the Jewish state. The Palestinians claim that Jerusalem, either in part or in whole, depending on the faction, belongs to the Palestinians and will be the capital of a future Arab state called Palestine. Gauthier illustrated the ramifications of Palestinian and Arab demands to divide Jerusalem along the so-called "green line." If such a division were to be made, the Old City, located east of the line, would fall under Arab Palestinian control, he showed on a map. The green line was never meant to be a source of rights and obligations, Gauthier said. The International Court of Justice at The Hague agrees. Rather, the green line simply served as a demarcation, showing where the fighting stopped between Israeli and Jordanian forces in 1949. And yet, the United Nations General Assembly and the U.N. Security Council, over subsequent decades, wrongly have treated eastern Jerusalem as if it were "occupied Palestinian territory," Gauthier said. "The Jewish people, whether they're Israelis or not, who are in Jerusalem  any part of Jerusalem  are there as of a right under the Law of Nations. They're not there as 'trespassers.' They're not there as 'occupiers.' They're not there 'wrongfully.' And, they're not there as 'settlers,' " he said. For 2,000 years, up until the mid-19th century, the walled Old City was Jerusalem, said Gauthier, showing a series of prints, photos and maps. Even in the early 20th century, there was little construction outside the ancient fortifications. "This is significant because in the minds of the Muslims, of the Palestinians, the real Jerusalem is the Old City," he said. "In the minds of many Jewish people I've met, many Israelis I've met, the sacred Jerusalem is the Old City." Even if parties could agree on the principle of dividing Jerusalem, Gauthier questioned where the division would be made. "You're dreaming in living color if you think that any division of Jerusalem will ever be acceptable to the Palestinians, to the Muslims, to the Arab world, unless they get their symbol of their supremacy over not only Judaism, but Christianity: the Old City," he said. Zionism arose at a crucial moment in history, Gauthier said, and presented its claim to those who had the legal power to fulfill it. Gauthier referenced Theodor Herzl's "The Jewish State: An Attempt at a Modern Solution to the Jewish Question" (1896), and said "the Jewish question" often has been interpreted as "the Jewish problem." The JH-V published reports and commentaries on the San Remo Resolution. This brief appeared in the April 29, 1920, issue, following San Remo's passage. "The Jewish problem is not a problem of the Jews. It's the problem of the nations. Mankind's got a problem," Gauthier said. "And many years ago ... people with a conscience decided to rectify things that had been done  crimes committed against the Jewish people for centuries. They decided it was time to make things right. And, they made decisions. They made commitments. They made pledges, which are being violated today." Herzl's most significant contribution wasn't his book, Gauthier said. It was the conference he organized in Basil, Switzerland, in 1897. 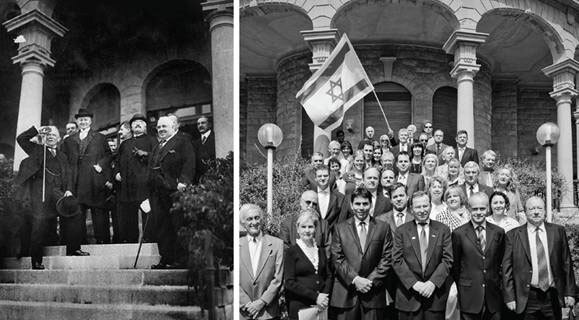 The central aim of the Zionist Congress was to create for the Jewish people a legally assured home in Palestine. Herzl died before that aim could be met, however, and thus Chaim Weizmann emerged as a leader in the Zionist movement. The British Cabinet issued the Balfour Declaration in 1917, a formal statement of policy favoring "the establishment in Palestine of a national home for the Jewish people." The Balfour Declaration later was incorporated into the Sèvres peace treaty (1920) and Mandate for Palestine (1923). In issuing the Balfour Declaration, the British Cabinet did not have the power of disposition. "They were fighting the Ottomans in the Middle East, but they did not have, legally, title to give to anyone," Gauthier said. "And yet, this declaration was very helpful, was very significant in respect to the advancement of the cause of the Zionist movement. It was helpful, but it's not the source," he said. So, who possessed title, if the British couldn't give it in 1917? The answer came from Paris, subsequent to the 1919 Paris Peace Conference, where the Principal Allied Powers met to deal with the consequences of World War I and the territories of the defeated German, Austro-Hungarian and Ottoman empires. One of the important products of this conference was that two groups  Jews and Arabs  each would receive recognition of peoplehood under international law, Gauthier said. Before the Paris Peace Conference, in 1918, Weizmann met with Faisal bin Hussein bin Ali al-Hashemi, son of the sharif of Mecca. At the start of Paris, the two leaders signed an agreement. "The head of the Arab delegation says to Weizmann: We will support your claim vis-à-vis Palestine. And, Weizmann says: We will support your claim for a very large independent Arab state in the bulk of the Ottoman territory," Gauthier paraphrased. In signing this agreement, the Jewish and Arab delegations were taking, in a political manner, the first step of the birthing process of legal rights for their respective peoples, Gauthier explained. It would be up to the Supreme Council of the Allied Powers to rule on the requests. While researching this history, Gauthier came across an article written by Harry Sacher, an advisor to Weizmann, just prior to the Paris Peace Conference. "When there are so many nations willing to say yes to the Jewish people and give them a Jewish state, he [Sacher] says in here: No, we don't want a state now. Give us the rights; we don't want to exercise the rights until we have developed a population, until we've evolved and we can responsibly and properly establish our state," Gauthier paraphrased. Sacher's angle was to establish a trust, with Britain, a member of the Supreme Council, acting as trustee. "He [Sacher] is the real architect of the modern State of Israel," Gauthier said. The Zionist organization took Sacher's plan and presented it in Paris: "They wanted recognition of the historic title of the Jewish people to Palestine and the right of the Jews to reconstitute their national home in Palestine," Gauthier said. "When you talk about the rights of Israel today and the Jewish people, never forget this term, 'to reconstitute.' It's not the same thing as when you establish a state," he emphasized. "Because, here, it means that you can look at the past and see what significance was attributed in the past to Jerusalem or to other parts of the Holy Land. "The Jews were given the right to reconstitute what they had. ... They're asking for recognition that they are a people. They're asking for recognition of the historic connection," Gauthier said. A new principle, thus, was introduced at Paris whereby trusts, or mandates, would be set up in certain territories to oversee a process until the respective peoples can take over and exercise autonomy and independence. The five Principal Allied Powers received the trusts, the titles. "If they have the title, they can turn around  unlike the British Cabinet at the time of the Balfour Declaration  and give it to somebody else," Gauthier said. In Europe, the map was reconfigured because of what the five nations decided to do. Territories, such as in Bulgaria and Hungary, were taken from the defeated nations and trusts were set up. "What they decided was binding," Gauthier said. Similar trusts that were established in the Middle East were equally binding, the international law scholar added. "The rights given to the Arabs were respected and honored," Gauthier said. "Only the Jewish people today are still imploring the nations to honor their rights." At Paris, the Principal Allied Powers opted to hold ruling on the requests of the Jews and the Arabs. Instead, they reconvened in the Italian city of San Remo on April 24-25, 1920. On the second day, the Powers said Yes to the Jews: Yes to their historical rights; Yes to the principle of reconstitution, meaning to favor the establishment, in Palestine, of a national home for the Jewish people. Gauthier summed up Weizmann's reactions to the San Remo decision, which gave Jews their rights under international law: "This is the most momentous political event in the whole history of the Zionist movement, and it's no exaggeration to say, in the whole history of our people since the Exile," he paraphrased. The Arabs had equal cause for celebration. "At the same conference, at the same time, they [the Arabs] were given rights in respect to Syria and Lebanon and Iraq," Gauthier said. "Recognition was given to them as a people and Yes was the answer to their demands for a large state. In fact, it was supposed to be one very large state." Three treaties were written to codify what was decided at San Remo: One was the Mandate for Syria and Lebanon, whose beneficiaries were mainly Arab. Arabs also were beneficiaries of the Iraq Mandate. The third mandate, concerning Palestine, was to benefit the Jews. "The British, who are already in Palestine under a military regime, changed that military regime into a civil regime because the decisions are made," Gauthier said. The rights were settled at San Remo concerning who legally owns Jerusalem. "In common law, we say it is res judicata," Gauthier said. "For Palestine, sovereignty-titled rights are given to the Jewish people. The other inhabitants, including the [Arab] Palestinians, are given rights, too, pertaining to civil matters, pertaining to religious matters. They still have some rights, but not the rights to sovereignty," he said. "The Palestinian people were not given any recognition as a people during the Paris Peace Conference. In fact, 'Palestinians,' in 1919, meant Jews and Arabs and others," he added. Though the British, in 1921, would end up giving the Arabs two-thirds of the Palestine Mandate (thereby creating Transjordan, later Jordan), Gauthier said that nothing has happened since the Mandate for Palestine that would take away from the rights given to the Jews. Article 18 of the U.N. Charter specifies that rights given to a people before the treaty are still valid. The International Court of Justice has made it clear that although the League of Nations was dissolved, this did not alter the validity of the mandates, and that until a final determination is made, the provisions of the mandates are still binding, Gauthier said. The 1947 U.N. Partition Plan for Palestine was a non-legally binding General Assembly resolution. "If all the parties had accepted [the partition plan] and a treaty had been entered into, then it would have become a source of international law," Gauthier said. Though the Jews were willing to accept the plan, the Arabs rejected it and, instead, attacked Israel in what would become the Jewish state's 1948 War of Independence. In his conclusion, Gauthier said that the issue of legal ownership over Jerusalem is a matter of international justice. "We're dealing with human rights," he said. "The rights have been granted." Howard Grief, "Legal Rights And Title Of Sovereignty Of The Jewish People To The Land Of Israel And Palestine Under International Law,"
Howard Grief, "The Legal Consequences Of The Israeli Government's Abandonment Of Judea And Samaria,"
William Mehlman, "A Landmark Work,"
Wallace Edward Brand, "Israeli Sovereignty over Jerusalem, Judea and Samaria,"
Yoram Shifftan, "A Legal Challenge To Sharon's Uprooting Policy,"
Yoram Shifftan, "Is Israel's Legal System Acting Illegally,"
Yoram Shifftan, "ISrael's Strangest Self-Defeating Paradox: Forgetting To Teach Itself And The World Jewish National Rights In Palestine,"
Yoram Shifftan and Bernice Lipkin, "Sharon As Judas Goat: Leading The Jews Out Of The Promised Land,"
Ted Belman, "Summary Of Israel's Legal Rights To Judea And Samaria,"
Ted Belman, "Jerusalem Is A Jewish Issue,"
Joshua Teitelbaum, "Israel As The Nation-State Of The Jewish People: From San Remo To The Netanyahu-Abbas Talks,"
Alex Rose, "Two Notable Events Recalled Through The Prism Of History,"
Elliott A Green, "International Law Regarding The Land Of Israel And Jerusalem,"
This article appeared in the Jewish Herald-Voice, December 2nd, 2010.